Today (6th April) I have had a full day. Lots of washing, cooking, washing dishes, picking up stuff ... you know? And then there is sport! At least LJs sport is not an all day thing (grateful for Basketball as opposed to Cricket). In fact, I am glad that LJ has a sport to go to at all! 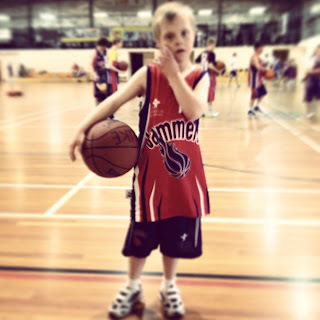 You see, having a child who has Down syndrome, can make it a bit difficult to get him involved in sport. Mind you LJ has great gross motor skills, but it's the turn taking and learning the rules that can take some time. Most clubs are great and very inclusive, but when it gets to competition, it can be a bit "tedious", usually for them, not us! Thankfully, however, there are lots of sporting groups specifically for kids and adults with Special Needs (including the Special Olympics). LJ however, has been taking part in a Basketball clinic style group. They learn the basic skills involved in Basketball and play games that incorporate those skills and at the end of the clinic they get to have a short game of Basketball. So, today I am grateful for the people who run these programs and the time and energy that goes into fund raising so that the fees can be kept to a minimum, making them accessible for most, particularly us. My Happy Ending will be that LJ will always be involved in sport that he enjoys.